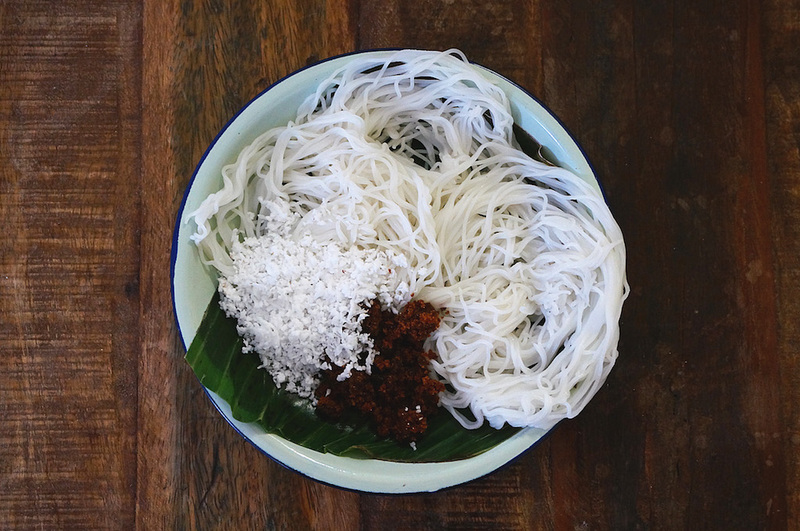 String Hoppers or Ididyapam is a breakfast dish made of rice flour, served with grated coconut and palm sugar. It originates from India, but they are very popular in a multicultural country, like Malaysia. It's known as Putu Mayam for the local residents. The meal is on a sweeter side, but you can always have it with some curry. Dry fry the rice flour on low heat for about 8 to 10 minutes. Add the salt and continue to fry for 2 more minutes. Slowly add in boiling water and mix well. Then transfer the mass dough into a flour sack towel or a kitchen towel. It will be very hot, let cool slightly if you can’t handle the heat. Cover the dough and knead for about 4 to 5 minutes or until it is soft and smooth. Put a piece of dough into a murukku maker, extrude the string hoppers onto the back of the bamboo tray or a steamer tray. Steam on medium heat for about 2 minutes. Remove and serve with chopped palm sugar and grated coconut.